Please find attached agenda for the General Meeting to be held at the Roma Administration Centre on April 23, 2014 at 9.00am. To be held at the Roma Administration Centre on 14 May 2014. Local Government Regulation 2012 Section 275(f) starting or defending legal proceedings involving the local government. Deputy Mayor Cr W S Wason chaired the meeting with Cr. J L Chambers, Cr. R J Denton, Cr P J Flynn, Cr. W M Newman, Cr. C J O’Neil, Cr. M L Price, Cr. D J Schefe, Chief Executive Officer – Julie Reitano, Coordinator Corporate Communications – Jane Frith, and Kelly Rogers Minutes Officer in attendance. Director Infrastructure Services – Cameron Castles, Director Corporate, Community & Commercial Services – Sharon Frank, Manager Airports (Roma, Injune, Surat & Mitchell) – Ben Jones, Manager Planning & Building Development – Danielle Pearn, Manager Infrastructure Contracts & Engineering Services Peter Weallans, Local Development Officer Injune – Amanda Whitney, Engineer – Paul Cummins, Manager Economic & Community Development – Ed Sims. The Deputy Mayor welcomed all present and declared the meeting open at 9.06am, noting that Cr. Schefe would be a late arrival at the meeting due to his attendance at a meeting with PCYC representatives. That apologies be received and leave of absence granted for Cr. Loughnan for this meeting. That the minutes of the General Meeting (5-26.03.14) held on 26 March 2014 be confirmed. This report sought Council's approval of a delegation under the Local Government Act 2009 to the Chief Executive Officer. Council resolves to delegate to the Chief Executive Officer, the exercise of its powers (under the Local Government Act 2009) in the terms of the tabled Instruments of Delegation in relation to the power to sign documents on behalf of Council. Cr. Flynn declared a ‘Conflict of Interest’ in the following item due to his personal business operations out of the Roma Airport, and left the Chamber at 9.11am, taking no further part in discussion or debate on the matter. Queensland Government Air Wing is disputing Passenger Tax charges issued for the month of October 2013 totalling $404.80 (GST Inclusive). Passenger Tax Charges have never been issued previously, and Council has since late last financial year applied Passenger Tax as charter operators are identified. QLD Government Air Wing has also disputed being classified as a charter aircraft, however, the aircraft is registered to the State of Queensland and has a weight above that which is allowed to park on the General Aviation apron. For this reason, the aircraft also needs to be accounted for in the flight schedule as availability of parking can be limited with other aircraft using the high strength apron. The aircraft can carry a passenger load of 13 passengers. That Council apply the Passenger Tax charges to the QLD Government Air Wing as per the adopted Fees and Charges. At cessation of discussion and debate on the abovementioned item, Cr. Flynn entered the Chamber at 9.12am. Cr. Schefe entered the Chamber at 9.14am. The report sought formalisation of Elected Member attendance at conferences and meetings as part of advocacy activities and/or enhancing strategy and policy development for Maranoa Regional Council. The Mayor at the LGAQ Civic Leaders Summit on 8 – 9 May at Twin Waters. Council had received requests seeking clarification of which user has right of way at the intersections of Bassett Court and Edna Street, and Bassett Court and Alexander Avenue. In order to remove ambiguity by installing either regulatory signage or lines, the classification of Bassett Court needs to be changed to give it precedence in the road hierarchy. Cr. O’Neil foreshadowed that he would likely move an amendment to the draft motion pending further technical advice from the Director of Infrastructure Services. The Chair called for and received a ‘Mover’ and ‘Seconder’ for the draft motion as recorded below, however, no vote was taken on the motion at that time. · Give way signs be installed on Alexander Avenue & Edna Street (running east-west) immediately. A name was sought for the new Street in Stage 1 of the Roma One Development. Cr. Wason declared a ‘Conflict of Interest’ in the following item due to him owning the parcel of land on which Mt Saltbush Quarry is sited; the operation of which sees him entitled to payment of Royalties (funds) for material extracted from the site. Mt Saltbush Quarry will be a market competitor of the applicant, in the event that Council approve the application presented. Cr. Wason requested a nomination for the role of Acting Chair, this nomination was received and voted on accordingly. Cr. Wason left the Chamber at 9.27am, taking no further part in discussion or debate on the matter. That Cr. O’Neil be nominated ‘Acting Chair’ in the absence of the Deputy Mayor following his declaration of a ‘Conflict of Interest’ in the following item. The application sought approval for a Material Change of Use - "Extractive Industry”, on land at 40742 Warrego Highway, Jackson QLD 4426 (described as Lot 26 on Plan BWR145 and Lot 28 on Plan BWR122). The application is subject to Impact Assessment against the relevant provisions of Bendemere Shire Planning Scheme 2006 including the Desired Environmental Outcomes and Rural Zone Code. Public notification was carried out between 6 December 2013 and 10 January 2014. One submission was received during this period. 1. Refer to http://www.cmdg.com.au for the Capricorn Municipal Development Guidelines (CMDG). 2. The relevant planning scheme for this Development Approval is the Bendemere Shire Planning Scheme 2006. All references to the ‘Planning Scheme’ and ‘Planning Scheme Schedules’ within these conditions refer to the above Planning Scheme. 3. Prior to commencement of use, the applicant shall contact Council to arrange a development compliance inspection. 4. All Aboriginal Cultural Heritage in Queensland is protected under the Aboriginal Cultural Heritage Act 2003 and penalty provisions apply for any unauthorized harm. Under the legislation a person carrying out an activity must take all reasonable and practicable measures to ensure the activity does not harm Aboriginal Cultural Heritage. This applies whether or not such places are recorded in an official register and whether or not they are located in, on or under private land. The developer is responsible for implementing reasonable and practical measures to ensure the Cultural Heritage Duty of Care Guidelines are met and for obtaining any clearances required from the responsible entity. 5. Queensland Rural Fire Service has advised construction standards for building in a medium bushfire risk area will apply. Building construction is to accord with the Building Code of Australia and State Planning Guidelines for building in bushfire prone areas. 1. The approved development is a Material Change of Use to establish an Extractive Industry (100,000 tonnes per annum) as shown on the approved plans. 2. All conditions relating to the establishment of the approved development must be fulfilled prior to any approved use commencing, unless otherwise noted within these conditions. 4. 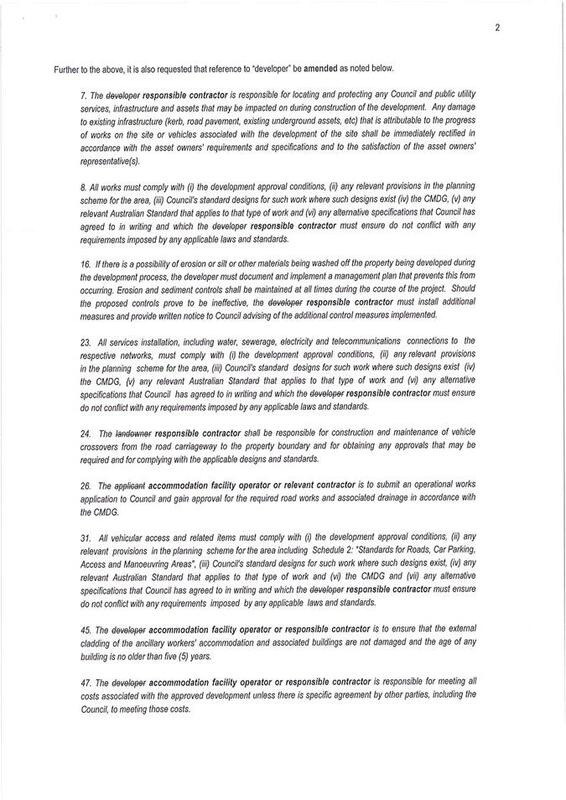 All works must comply with (i) the development approval conditions, (ii) any relevant provisions in the planning scheme for the area, (iii) Council’s standard designs for such work where such designs exist (iv) the CMDG, (v) any relevant Australian Standard that applies to that type of work and (vi) any alternative specifications that Council has agreed to in writing and which the developer must ensure do not conflict with any requirements imposed by any applicable laws and standards. 5. This approval relies on the environmental authority (and its related documents) applicable to the site to provide the basis for managing environmental impacts and this approval also relies on the entity approving and managing the environmental authority to meet its responsibilities. The Council will not take any responsibility for the management of environmental impacts unless and until the entity (or its legal successors) is unable to act. The standards and approval of civil works and services are the responsibility of the Council but subject to environmental impact management requirements that may be imposed by the environmental authority (or any approval that effectively replaces that environmental authority). 6. Hours of operation, including the transporting of material from the site are restricted to 6:00am to 6:00pm Monday to Saturday. No work is permitted on Sundays or public holidays. The quarry operator may apply to Council to vary the hours of operation for a particular project, where the extended operating hours are essential in the opinion of the Council because of the requirements and community benefits of the particular project. Any Council approval of the varied hours will be restricted to the duration of the project, and may be rescinded by the Council on seven days notice if the extended hours of operation are considered to be causing undue nuisance or disruption to other persons. 7. Any advertising signage is subject to a further development approval unless compliant with the self-assessable development provisions of the planning scheme. 8. Effluent storage and removal must not have an adverse effect on the surrounding areas and must not cause nuisance to neighbouring properties. 9. Waste containers shall be maintained in a clean and tidy state at all times while the use continues, and shall be emptied, and the waste removed from the site on a regular basis. 10. The approved development and the premises are to be maintained in a clean and tidy condition and not to pose any health and safety risks to the community. 11. Extraction areas, access and site roadways and surrounds shall be kept in an orderly fashion and free of rubbish. 12. No nuisance is to be caused to adjoining properties and their occupiers by the way of smoke, dust, rubbish, contaminant, stormwater discharge or siltation at any time, including non-working hours. 14. All earthworks for the development shall be undertaken in accordance with Capricorn Municipal Development Guidelines (CMDG) D6 ‘Site Regrading’ Design Guidelines. 15. Erosion and Sediment Control is to be managed as shown in the Site Based Management Plan Section 4.3 prepared by StruXi Design. 16. Any construction works on site are to be undertaken in accordance with the Soil Erosion and Sediment Control Engineering Guidelines for Queensland Construction Sites (Institute of Engineers Australia). 17. Where it is necessary for a road and/or drainage system to be reinstated or cleaned up as a result of erosion and/or sedimentation from the site, such works must be undertaken at the developer’s expense. Such works shall be undertaken immediately, where it is a potential hazard to pedestrians and/or passing traffic. 18. An onsite sewerage system may be installed, and shall be designed in accordance with Schedule 5 – Standards for Sewerage Supply of the Planning Scheme. An additional development permit for plumbing and drainage works shall be sought from Council for any proposed onsite sewerage system. 19. The site must be provided with an on-site water supply with sufficient capacity to meet all operational needs, including watering to minimise dust nuisance. A potable water supply sufficient to meet the needs of staff and visitors to the site shall also be supplied. 20. All supplies of potable water and disposal of waste water is to be by a suitably licenced contractor. 21. Electrical supply provision may be by onsite generation. 22. Stormwater, is to be managed as shown in the Site Based Management Plan Section 4.3 prepared by StruXi Design and in accordance with the CMDG – D5 Design Guidelines ‘Stormwater Drainage Design’. 23. The developer shall ensure that in all cases, discharge of stormwater runoff from the development drains freely, and that no nuisance of ponding is created within the vicinity of the development. 24. There shall be no increases in any silt loads or contaminants in any overland flow from the property being developed, either during the development process or after the development has been completed. 25. All weather vehicle access shall be provided for traffic movement within the development site. 26. Unsealed internal roads are to be watered upon receipt of any complaint regarding dust nuisance caused by vehicle movements to and from the site. 27. The Environmental Protection Act 1994 states that a person must not carry out any activity that causes, or is likely to cause, environmental harm unless the person takes all reasonable and practicable measures to prevent or minimise the harm. Environmental harm includes environmental nuisance. In this regard, persons and entities involved in the operation of the approved development are to adhere to their ‘general environmental duty’ to minimise the risk of causing environmental harm to adjoining premises. 28. At the end of operations, remediation of the site is to occur in consultation with the landowner, generally in accordance with the program shown in the Site Based Management Plan Section 3.5, (prepared by StruXi Design), and also in accordance with the current Environmental Authorities. 29. The operator is to develop and implement appropriate bushfire mitigation plans for the development site prior to commencement of the use. 30. If the environmental approval issued by a State agency to undertake this use on this site ceases to have effect and is not replaced by an appropriate approval, code or law to manage the use and the rehabilitation of the site, then the conditions, requirements and obligations of the original environmental approval given for this use on this site shall become conditions of this approval. References in the original environmental approval to the State agency will then be construed as references to the Council to the greatest extent possible. The standards referenced by the original environmental approval will be the applicable standards. 31. A local roads additional impacts charge will be paid to Maranoa Regional Council in accordance with the Local Roads Additional Impacts Charges Schedule A, attached to and forming part of these conditions. 32. All matters contained within this development approval may be covered by infrastructure agreements or deeds of agreement between the relevant parties for each matter. Only parties which are directly affected by the contents of each infrastructure agreement or deed of agreement need to be parties to the agreements. 33. All fees, rates, interest and other charges levied on the property, shall be paid in accordance with the rate at the time of payment. 34. Complete and maintain the approved development as follows: (i) in accordance with development approval documents and (ii) strictly in accordance with those parts of the approved development which have been specified in detail by the Council or Referral Agency unless the Council or Referral Agency agrees in writing that those parts will be adequately complied with by amended specifications. 35. Complete and maintain all operational, building and plumbing and drainage work associated with this development approval, including work required by any of the development approval conditions. 36. The developer is responsible for locating and protecting any Council and public utility services, infrastructure and assets that may be impacted on during construction of the development. Any damage to existing infrastructure (road pavement, existing underground assets, signs etc) that is attributable to the progress of works on the site or vehicles associated with the development of the site shall be immediately rectified in accordance with the asset owners’ requirements and specifications and to the satisfaction of the asset owners’ representative(s). 37. Council is to be indemnified against any claims arising from works carried out by the applicant on Council’s property. 38. The developer is responsible for meeting all costs associated with the approved development unless there is specific agreement by other parties, including the Council, to meeting those costs. 39. All rates and charges of any description and all arrears of such rates and charges, together with interest outstanding thereon, on the land, due to the Council, shall be paid to the Council prior to any approved use commencing. 40. Where another condition refers to a specific published standard, manual or guideline, including specifications, drawings, provisions and criteria within those documents, that condition shall be deemed as referring to the latest versions of those publications that are publicly available at the time the first operational works or compliance approval is lodged with the assessment manager or approval agency for those types of works to be performed or approved, unless a regulation or law requires otherwise. 41. It is the developer’s responsibility to ensure all entities associated with this Development Approval have a legible copy of the Decision Notice and the Approved Plans and Approved Documents bearing ‘Council Approval’. 42. All easement conditions must be maintained. 43. No aspect of the development or activities associated with the development are to occur within the existing easement. 44. No aspect of development is to cause subsidence, ground instability or changes in ground level within the easement area or within 10 metres of either side of the SWER line. protected and Ergon Energy has unrestricted access for maintenance and operation needs. Note: an Ergon Energy lock can be provided. 46. Electrical safety clearances for both the SWER line and 132 kV Powerline must be maintained at all times. All works must comply with the Electrical Safety Act 2002 (the Act). Note: the SWER line may need to be moved to comply with the Act and this condition. 47. No significant increase in airborne pollutants (ie. dust) is to occur as a result of the proposal, to limit adverse impacts on electrical infrastructure. 48. Should changes to Ergon Energy infrastructure be proposed or required, including to the SWER line, as part of the development, those changes are made with Ergon Energy's consent and at the developer/owner's expense. 49. The developer will be required (if needed) to negotiate electricity supply arrangements by applying in writing to Ergon Energy, or by contacting Ergon Energy on 13 10 46. Early contact is recommended. Should the development require permanent electrical distribution infrastructure for its ongoing operations (eg. Pad mounted transformers), early contact with Ergon Energy (ie. prior to detailed design) can ensure any requirements are accounted for in a timely and efficient manner. 1. This condition is required because the development will impact on the local roads when materials associated with the operation of the extractive industry are carried along those local roads. The local roads additional impacts charge covers all roads in the Maranoa Regional Council Area where heavy vehicles of the type used in this activity/use are permitted to travel. The tonnage of extracted material leaving the extractive industry is deemed to be a proportional measure of the total traffic to and from the site. 2. A local roads additional impacts charge of $0.50 per tonne will be paid to Maranoa Regional Council for all extracted material transported from the site. This is the local roads additional impacts charge for the 2013-2014 financial year. Until such time as (1) the methodology is amended or (2) the level of use is changed or (3) Council has amended charges as a result of a review requested by the extractive industry operator, the local roads additional impacts charges amount will be increased or decreased annually by a percentage equivalent to the change in All groups consumer price index for Brisbane published by the Australian Statistician. 3. The payment of the local roads additional impacts charge must be made by the extractive industry operator within 14 days of the end of each 3 month period, with the periods starting with the commencement of the use/activity. The extractive industry operator must calculate the payment and provide details of the calculation. If no payment is made within the set time, the Council may demand payment based on the maximum approved annual production capacity of the activity/use divided by 4. The maximum approved annual production capacity of the extractive industry will be deemed to be the maximum capacity of the extractive industry listed in the approvals for the site. If the extractive industry operator does not pay the local roads additional impacts charge for two consecutive periods, the Council can require the holder of the development approval to pay the local roads additional impacts charge to the Council. 4. The holder of the development approval or the extractive industry operator may ask for the local roads additional impacts charge to be reviewed once in every three year period after the approval for the activity/use was given. The review will take account of the rates and methodology applying to similar operators in the Council Area and the facts and circumstances applying to this approved activity/use. 5. The Council may review and amend the methodology for calculating the local roads additional impacts charge but any changes resulting from amendments to the methodology will not take effect for a minimum of 2 years from the date of adoption by Council unless the extractive industry operator request earlier changes to the charges. 6. Despite the payment of a local roads additional impacts charge, the Council may stop the extractive industry operator from using particular roads. The reasons may include Council concerns about the level of damage being caused or may be caused to those particular local roads by the addition to total road use of heavy vehicles associated with the extractive industry. 7. Council or its representatives is entitled to inspect, copy and audit any records which may help to prove the actual use of the road network by the extractive industry operator or the approval holder(s) for the purposes of assessing the local roads additional impacts charge. The extractive industry operator and the approval holder(s) have agreed by the acceptance of this condition that the Council has their agreement and permission to access those records wherever held and that their agreement and permission cannot be revoked. 8. These charges can be included within an infrastructure agreement or deed of agreement with the Council, the extractive industry operator and any other relevant parties by consent of the parties. The extractive industry operator, the approval holder and the Council may vary the charges and other factors by mutual consent where circumstances warrant such variations and the community interest is protected. At cessation of the abovementioned item, Cr. Wason entered the Chamber and assumed the Chair at 9.32am. 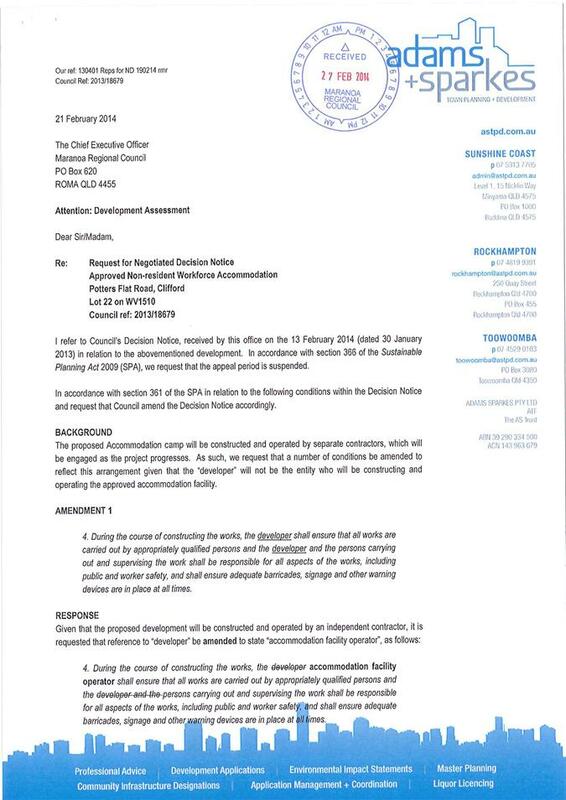 Council had received correspondence from the Booringa Action Group (BAG) enquiring as to Council’s future plans for the former Maranoa Retirement Village buildings and surrounds. BAG have requested that the retirement village buildings be used to house a more permanent WORK Camp facility. As the Maranoa Retirement Village has been closed for nearly 12 months, it is timely that Council now consider the future of the site. 1. Approach the Department of Justice and Attorney General and commence communications in regard to the WORK program relocating to the former Maranoa Retirement Village. 2. Provide the Maranoa Retirement Village Auxiliary with a timeframe (no later than 30 June 2014) for removal all equipment belonging to the organization with all fixtures to remain on site. 3. Contact the Department of Natural Resources and Mines to explore the opportunity to convert tenure type from reserve to freehold. Mandandanji Cultural Heritage Services Pty Ltd have developed a future development plan for the Mandandanji Park that is being developed near the Bungil Creek bridge crossing on the Warrego Highway Roma. As the park is located on a reserve managed by Council, Council’s formal consideration of the plans were sought. 1. Apply to the Department of Natural Resources and Mines to have part of the reserve excised and the type of reserve changed from “Water and Road Reserve” to “Cultural Reserve” or similar. 2. Support in principle Mandandanji Cultural Heritage Services Pty Ltd’s future plans for the site, being construction of a yarning circle, additional display case and toilet block on the site, subject to issues relating to allowable development on this reserve type being resolved. 3. Refer the matter of water connection costs to the 2014/15 budget deliberations. (Connection costs are estimated at $11,968.44). Subject Heading: Support for Outback Queensland Tourism Association's application for Contestable Funding. The Queensland Government is currently accepting applications from Regional Tourism Organisations, (RTOs) for their 2014/2015 Contestable Grant Scheme. This program provides opportunity for RTOs to apply for additional funding for specific marketing and promotional campaigns. In the 2013/14 financial year, Outback Queensland Tourism Association (OQTA) was successful in their application for a Contestable Grant and was subsequently able to leverage their marketing allocation to obtain an additional $652,000. This funding was used to promote the highly successful “Eventures” campaign. OQTA are inviting all Local Government members and Associations in Outback Queensland to partner with them for additional funding under the RTO Contestable Grant Scheme in 2014/15. Should Council choose to participate, a letter will be required confirming the financial contribution. Based on the 2013/14 budget allocation, this report proposed that if Council chooses to partner with OQTA in their Contestable Grant application, then an amount of $13,000 would be recommended. At worse case this may be matched $ for $ or at best $ for $1.5. If the application is successful, OQTA will promote “Eventures” as the call to action, providing opportunity for the Maranoa to promote our major events both within and outside of the Outback Queensland region. 1. Support Outback Queensland Tourism Association in their application under the RTO Contestable Grant Scheme. 2. Contribute an amount of $13,000 toward the application of OQTA in the RTO Contestable Grant Scheme 2014/15. 3. Write a letter of support for the application of OQTA in the RTO Contestable Grant Scheme, confirming their nominated financial contribution. The Department of Communities, Child Safety and Disability Services has provided Maranoa Regional Council with $50,000 funding as part of the Drought Relief Assistance Scheme. All events and projects were approved by the Department prior to being committed and delivered. Confirmed events and projects coordinated throughout the Maranoa Region, and applicable funding allocations were provided to Council for information purposes. That Council receives and notes the Officer’s report as presented. A letter of petition had been received from a number of residents residing on Garden Street Yuleba, who are concerned about an increasing volume of trucks turning into Stephensen Street from the highway and travelling along Garden Street. Residents advise that the heavy vehicles are creating noise and dust at all hours of the night and day, impacting local residents in the vicinity. 2. Be provided with a follow up report detailing investigations into the matters raised. Council awarded Tender 14019 to Akwa-Worx Pty Ltd for the supply, installation and commissioning of Chlorine Disinfection Dosing systems at up to 15 sites in towns in the region centred around Roma. Akwa-Worx Pty Ltd have put forward a proposal that will result in significant future cost savings, and increase the effectiveness of the water disinfection process. 1. Incorporate an increase to the expenditure budget of $103,192 (excl. GST) funded by increased water revenue estimates. 2. Award a Variation to Akwa-Worx Pty Ltd, for that amount, for the addition of supply, installation and commissioning of PH correction dosing equipment. Council adjourned the meeting for morning tea at 10.03am. That Council close the meeting to the public at 10.46am. Cr. Newman left the Chamber at 10.50am. Cr. Newman entered the Chamber at 10.53am. Cr. Wason declared a perceived ‘Conflict of Interest’ in item C.2 “Business Activities Report Saleyards and Quarry,” due to him owning the parcel of land on which Mt Saltbush Quarry is sited, the operation of which sees him entitled to payment of Royalties (funds) for material extracted from the site. Mt Saltbush Quarry is a market competitor of the Council owned and operated Roma Quarry. Cr. Wason elected to remain in the Chamber for discussion on the matter, on the basis that it would not alter his ability to consider the presented report, which was provided for Council’s information only and a decision was not required. Cr. O’Neil left the Chamber at 11.45am. Cr. O’Neil entered the Chamber at 11.55am. Cr. Flynn left the Chamber at 12.05pm. Cr. Flynn entered the Chamber at 12.14pm. Council adjourned the meeting for lunch at 12.49pm. That Council open the meeting to the public at 1.36pm. Council is undertaking the project management of substantial capital upgrade works on its road network on behalf of APLNG Origin. The upgrade works involve a number of projects identified in the APLNG Road Impact Assessments (RIA). 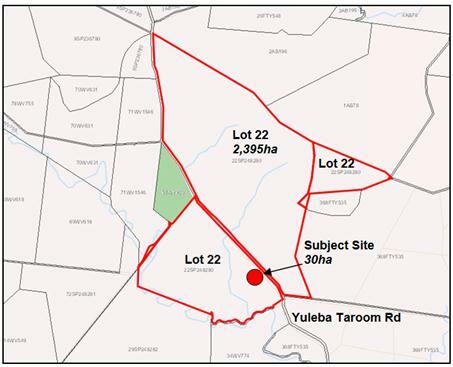 The total estimated cost of works on the Yuleba Taroom Road, Reedy Creek Road and Horse Creek Road is in the order of $55 million of which approximately $10.5 million has been completed to date. That Council engage Brandon & Associates Pty Ltd on an hourly rate basis from the Panel of Preferred Suppliers – Engineering Services Arrangement 13/36, to provide Engineering Services associated with the delivery of Council’s Energy Sector funded Capital Works identified as Work Packages WP2d (Yuleba Taroom Road) and WP4 (Horse Creek Road). Cr. Wason declared a perceived ‘Conflict of Interest’ in the following item, due to him owning the parcel of land on which Mt Saltbush Quarry is sited, the operation of which sees him entitled to payment of Royalties (funds) for material extracted from the site. Mt Saltbush Quarry is a market competitor of the Council owned and operated Roma Quarry. Cr. Wason elected to remain in the Chamber for discussion on the matter, on the basis that it would not alter his ability to consider the presented report, which was provided for Council’s information only and a decision was not required. This monthly report was presented to Council to provide a summary of the performance of Council’s Quarry and Saleyards both over the past month and year to date. The information in this report aims to review the month’s activities, give an overview of financial performance and bring to Council’s attention any emerging issues. The applicant has proposed to pay off outstanding rates over a timeframe that exceeds Council’s adopted policy. That Council accept the applicant’s proposed payment plan of $500 per month until 30 June 2018 which would repay rates in full (including rates in arrears and estimated future rates). The report sought Council approval for a number of recommended minor adjustments to the Organisational Structure. · Remove two Personal Care Assistant – Wallumbilla positions from the organisational chart due to extended vacancies. Maranoa Regional Council offers a Young Endeavour Youth Scheme Scholarship to one young person from the Maranoa Region each year. Applications for the 2014 scholarship opened on 17 February and closed on 24 March. Received applications were assessed by the selection panel on 28 March. That Council endorse the panel’s nomination for the 2014 Young Endeavour Scholarship, being Amy Garland. The current Service Agreement for the Movement of Cattle at the Roma Saleyards is due to expire on 30 April 2014. Council has the option to renew the agreement for a second term at its sole discretion subject to clause 5.2 of the agreement. Furthermore, the current contractor has requested a variation to the agreement. 1. Exercise the option to renew the Service Agreement for the Movement of Cattle at the Roma Saleyards with Grumpy Yard Management Pty Ltd for a second term of two years commencing 1 May 2014 and expiring 30 April 2016. Origin Energy APLNG has funded the upgrade of the intersection between Roma Taroom Road and Wybara Road and Council are completing the construction of these works. Part of this contract involves the supply, laying and compacting of DG14 asphalt. The purpose of this tender is to provide this asphalt surface. That Council award Tender and Contract to Boral Resources PTY Limited for the amount of $226,473.78 (excl GST), on the basis that it was considered the most advantageous given the reduced transport requirements. The report proposed a two stage process, with a view to progressing the changes for two Departments, with further workshops and discussions to occur for Maintenance & Construction. 1. Approve, for advertising, the new Department of Resource Coordination (selected positions), incorporating Council’s current Plant & Workshop Unit, and additional positions within Infrastructure Planning & Design. 2. Note an additional proposal for a Department of Works (Roads, Drainage & Parks), for further internal consultation. 3. Authorise the Chief Executive Officer or delegate to pursue available resources for the position of ‘Chemical Engineer,’ on a part time basis. 4. If successful in securing a candidate to fill the position of ‘Surveyor,’ commence recruitment for the position of a ‘Chainman.’ (This position complements the skillset and tasks required of an ‘on staff’ Surveyor). Tabling of a letter received from the Department of Natural Resources & Mines in relation to Marra Marra Road and associated Permit to Occupy application. 1. Note the compliance action requirements to finalise this matter as outlined by the Chief Executive Officer. 2. Authorise the Chief Executive Officer to negotiate arrangements with respect to the licensed grid. 3. Make arrangements to remove the Council owned grid within 30 days of the completion of the notified compliance period. Council has been approached by a multi-media company which has a concept for an online web portal which is called “Our Town Plus More” (OTPM). Touch Point Media (TPM) is a consortium of Miller Communications Group and Click Connect. That Council advise the Department of Science, Information Technology, Innovation and the Arts (DSITIA) that it is in an advanced stage of development of its own regional portal and as a consequence has declined participation in the Touch Point Media (TPM) “Online Regional System” pilot project which is being entertained for sponsorship by the DSITIA. There being no further business, the Deputy Mayor thanked Council for their attendance and declared the meeting closed at 2.03pm. These Minutes are to be confirmed at the next General Meeting of Council to be held on 23 April 2014, at Roma Administration Centre. This report provides a copy of the confirmed meeting minutes of the advisory committees that held meeting during the months of February 2014 – March 2014. Council initiated advisory committee meeting minutes are circulated to Councilors on a monthly basis to ensure Council is aware of committee items discussed. Specific recommendations requiring Council’s consideration will continue to be put forward by the Chair, or attending Councillor representative on an ‘as needs’ basis. The formation of Council initiated committees is a positive forum in which to engage the community and key stakeholders on Council projects and business areas. Present to Council the proposed sale of the council drink vending machine to the Roma Aero Club. That the Airport Advisory Committee Meeting minutes of 5 February 2014 be confirmed. The committee requested feedback on the proposal to charge passenger tax for charters at Injune Airport. Ben advised that the item is to be presented at the next Council meeting on 12th March 2014. The Committee requested feedback on the proposed sale of the council drink vending machine to the Roma Aero Club. Ben advised that the item is to be presented at the next Council meeting on 12th March 2014. Committee discussed the Terms of Reference for the committee, all members in attendance agreed that they do not wish for the committee to be classified as a statutory body. Ben is to consult with Kelly and receive in writing the current status of the committee. This is to be presented at the next meeting for the committee to review the Terms of Reference for amendment. Lyn Kajewski met with Megan Swords Coordinator – Tourism, to develop a tourism billboard to be placed at the baggage collection area of the Roma Airport. It is intended that the billboard will promote events and services in the region. The committee discussed the concept at length and agreed the Megan and Ben will need to meet to discuss further and decide on the best location for signage. Lyn advised that she would coordinate the meeting. Greg Shaw asked if there had been any further progress on the installation of the VASI lights for Roma Airport. Ben advised that he is currently awaiting quotes on the equipment and the management of the installation. Ben is aiming that pending receiving the requested quotes in a timely manner, installation should commence this month. From there Ben anticipates approximately 1 month to complete the project, however this will depend on feedback provided when installation commences. Ben advised that he will keep the committee updated on the progress. Greg Shaw noted that the congestion at the Roma Airport for air traffic has increased significantly; he suggested that Council consider building a taxiway to the end of runway 36 so aircraft can avoid back tracking along the runway. Ben advised the committee on the recent Office of Transport Security (OTS) audit at Roma Airport. The audit included reviewing the Visitor Identification Card records, management records and a systems test at the screening point. The audit was successful and the systems test was passed again. This is the fifth systems test conducted since February 2013 and each one has been a 100% pass. Cr. Denton asked Ben if he had been able to resolve the complaint that was in the Western Star. Ben advised that he has not been able to contact the passenger as yet. Ben has been consulting with Wayne Bryant, the Baggage Handling Agent Manager for QantasLink at Roma Airport and as yet has not been able to identify the passenger. Ben advised the committee on the recent Civil Aviation Safety Authority (CASA) level two surveillance at Roma Airport. There was one item noted in the surveillance, a runway light located at the cross strip did not meet requirement as it sat to low. The light has been levelled with the runway and meets the required standard. Ben advised the committee that a drain has been installed in the vicinity of the Aero Club to stop rain water flowing under the Aero Club building. Airport staff will be monitoring the area to ensure that no further leak is occurring. Ben provided committee members an update on reportable incidents over the past month since the committee last convened. The committee requested an update on the terminal and car park design. Ben advised that the preliminary designs should be received by 13th March; this will be both the terminal and the car park designs. Once the designs have been received then an engineering review will be completed and the designs will be presented to council. The committee requested feedback on the possible Qantas lounge to be included in the terminal. Ben advised that he has had no further contact from Qantas after a discussion several months ago. Qantas requested a price for the lounge and Ben asked them to provide a list of what they required within the lounge, such as amenities, water etc. The committee requested an update on the new menu items that were to be provided by Nektar at the airport kiosk. The committee were advised that the new menu items were intended to begin from approximately 20th February but as yet have not commenced. The committee did not think this was satisfactory and requested follow up on this. Ben advised the committee of the recent announcement regarding the Roma - Brisbane, Roma - Charleville route. The route will continue to be regulated with QantasLink the current service provider – the route will be retendered in 2015. The committee discussed the route regulation at length. The committee requested feedback on the progress of refunding RFDS and Careflight for landing charges at Council’s airports. Ben advised that the process has not yet been finished due to unexpected leave of staff working on the issue. It is intended that this will be completed by the end of the month. Meryl Brumpton requested that action items still in progress be carried over to the next meeting so that committee members know when an action item is still on-going. The committee agreed this was a beneficial method of keeping track of outstanding meeting actions. The Committee scheduled the next meeting for 2 April 2014 commencing 6pm, to be held at the Council Chambers. Greg Shaw noted that he would be an apology for the next meeting. The meeting was closed at 6:50pm. Attendees: Cr. Cameron O’Neil, Cr. Peter Flynn, Rob Hayward, Fiona Vincent, Emily Rogers, Carla Cosgrove, Kevin Pope, Mark Brandt, Jackie Erickson, Jim Schefe, Paul Robertson, Fay Robertson, John Mulcahy, James McAuley, Ranald Ferrier, Tina Hamilton, Shirley Ayers. Apologies Alistair Brown, Lorinda Otto, Cassandra Elder, Bill McClean, Lucy Warby, Loretta Thomas, Yoland Thomas, Sussan Evans, Angela Lorenz, Linda Arnold, Jason Coonan, Craig Smith, Greg Stewart, Sandy Wendt, , Kathy Mitchell, Shirley Ayers, Dayle Little & Tina Hamilton. Meeting minutes to be signed by Chair, placed on Council’s website and presented to Council at the second General Meeting 26/03/14. Facility lighting upgrade and upgrade of the P.A. system (including portability) be escalated to a “high” priority project. Attending Camp draft members requested a weather proof cover be installed around the bar area. It was requested that access during events be considered through the distribution of a calendar of events & that this be issued 1 month in advance to trainers. It was suggested that track work be completed by 7.00am on event days. It was requested that top dressing be supplied in the Rodeo Arena and that the replacement of blown bulbs be completed to restore lighting capability. Cr. Flynn recommended that the male toilets next to the viewing area be upgraded/painted. Cr. O’Neil requested the northern end of the Wool Pavilion be painted and a check done with respect to the presence of any asbestos sheeting that is damaged and requires removal. Cr. O’Neil requested the signage on the sheep yard be restored/painted. That the minutes of the Bassett Park Advisory Committee Meeting held on 16 September 2013 be confirmed as presented. Chair, Cr. Cameron O’Neil provided outline of option to retain the existing structure and refit, as an alternative to building a new one. Attending members reviewed and broadly discussed the Council prioritised list of projects as part of the endorsed Bassett Park Master Plan. It was agreed that Council Officer’s consult with each of the user groups to determine each group’s priorities and in consideration of the Council prioritised list. That facility lighting upgrade and upgrade of the P.A. system (including portability) be escalated to a “high” priority project. · Attending Camp Draft members requested a weather proof cover be installed around the bar area. · It was requested that access during events be considered through the distribution of a calendar of events & that this be issued 1 month in advance to trainers. It was suggested that track work be completed by 7.00am on event days. · It was requested that top dressing be supplied in the Rodeo Arena and that the replacement of blown bulbs be completed to restore lighting capability. · Cr. Flynn recommended that the male toilets next to the viewing area be upgraded/painted. · Cr. O’Neil requested the northern end of the Wool Pavilion be painted and a check done with respect to the presence of any asbestos sheeting that is damaged and requires removal. · Cr. O’Neil requested the signage on the sheep yard be restored/painted. A request has been received to name a new street created as part of the development at 6 South Street, Roma. That Council name the new road created as part of the development at 6 South Street Bottletree Court. 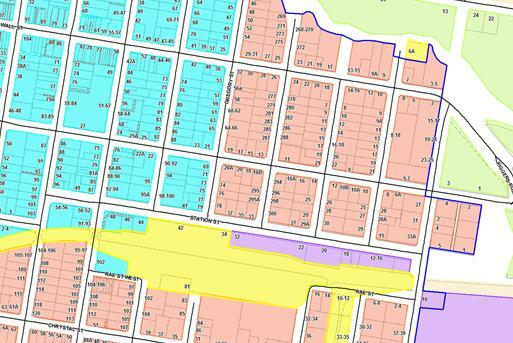 Council has received a request from Chris Hill seeking a name for the new street to be created as part of the subdivision of land at 6 South Street, Roma. The unnamed street is required to be named before addressing numbers can be provided and to support emergency service access. The developer has suggested the street be named Bottletree Court. This name was taken to the Councilor Workshop on 16 April 2014. A plan showing the location of the street to be named is attached. That Council approve the submission of an Expression of Interest to Arts Queensland for $30,000 for RADF funding in 2014/15 and provide the required contribution of $12,857 from Council’s 2014/15 budget allocations. Arts Queensland is implementing a simplified process for allocation of RADF funding to councils in 2014/15. Councils are being asked to provide an Expression of Interest, rather than an Annual Bid. Maranoa Regional Council received $30,000 in the 2013/14 RADF allocation, and provided the required contribution of $12,857 in a 70:30 ratio. This allocation is based on our population (class 2). Council has successfully disbursed all the RADF funds for the 2013/14 financial year and there are no carry-over funds. A contribution of $12,857 is required from Council to ensure an allocation from Arts Queensland. Failure to provide the required funds in the 2014/15 budget will place the RADF program at risk. The RADF program is identified as an objective in the Council Arts and Culture policy. Maranoa residents have raised the importance of replacing the unsealed boat ramp with a concrete boat ramp on the Maranoa River at Fisherman’s Rest, Mitchell. This would avoid damage occurring to personal equipment and most importantly safer and easier access to the water. 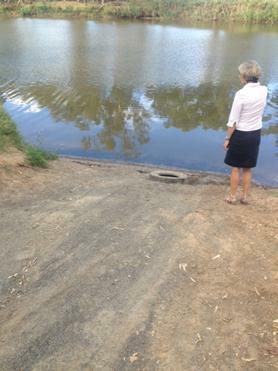 Due to the extremely low water level currently being experienced in the Maranoa River, the ramp is exceptionally steep, undermined at the water line and very unsafe, although residents and visitors continue to unload boats and jet skis into the River at this location proving what a popular amenity this is. Installation of the ramp with a diminished water line will allow an extended ramp exit to the waterline. That Council approve the installation of a concrete boat ramp at Fisherman’s Rest, Mitchell. Local residents have on numerous occasions raised the importance of having a concrete boat ramp, due to the dirt ramp being unusable in wet weather, erodes badly after heavy rain, is very steep when the River level drops and an upgrade would include appropriate signage on safe usage of the amenity. The need for this upgrade is critical at present due to an increase in Maranoa residents using the Maranoa River. This may be in part due to Lake Never Fill having a cost associated with use (access via a paid gate key) and the Lake’s low water level. Keith Harrison, local Mitchell builder has provided Council staff with a very fair quote charging for the materials and donating almost all of the labour, in the hope that if the project can be finalised, residents will have safe water access as the number of community members who have boats and jet skis increases. Keith has his own interest as presently his personal boat ramp is being adversely affected with overuse. Sun Water has been contacted and as the area in question is outside of their Weir pool, they do not have an interest in the project. DERM Toowoomba staff has been contacted and have advised that Council is able to install the ramp without the need for a permit under the attached Riverine Protection Exemption Requirements. No prior approval is required from DERM, provided the boat ramp is installed according to the minimum requirements in Section 4 of the Requirements. Local Development Officer, Jane Fenton has been surveying local resident’s ideas and concerns of the current ramp. One question asked was whether there was a need for a double access ramp. The general consensus is that a single ramp is ample due to wait periods to access the facility being non existent. Local residents are putting people in the water to hold the rear of the craft out of the water until the front can be lowered into the water at the same time as the rear while unloading and loading boats. Locals have been asked about the positioning of the ramp and have specified that the current location works well. Aurecon staff has advised that FKG have the tender to repair flood damage to the Mitchell River Walk. This will see reinstatement of the shade shelter and bins at Fisherman’s Rest, so the ramp would tie in nicely with these restoration works. Tanya Mansfield has advised Council are covered with present insurance and have a duty of care to users as Council are aware of the heavy usage at this recreational spot on the Maranoa River. Corporate Plan 2009-2013 — 8.4.5(a) To develop partnerships to cultivate and facilitate sporting and recreational opportunities to meet the community’s needs and aspirations so as to enhance the quality of life and wellbeing for residents of our region. 7. The developer is responsible for locating and protecting any Council and public utility services, infrastructure and assets that may be impacted on during construction of the development. Any damage to existing infrastructure (kerb, road pavement, existing underground assets, etc) that is attributable to the progress of works on the site or vehicles associated with the development of the site shall be immediately rectified in accordance with the asset owners’ requirements and specifications and to the satisfaction of the asset owners’ representative(s). The applicant has appeal rights under the Sustainable Planning Act 2009 against any decision of Council. An approval for a Material Change of Use - ‘Undefined Use’ (Non-resident Workforce Accommodation – 360 Units) was approved on 22 January 2014. On 21 February 2014, the applicant requested amendments to the conditions of approval. The requested amendments focus on two issues identified below, renaming responsible entities within the approval, and the onsite power generation. The applicant wishes the conditions of approval to state that the developer or landowner is not necessarily responsible for a particular condition, and that instead an ‘operator’ or ‘relevant contractor’ is to be named as responsible for that condition. (x) Condition 47, developer to ‘accommodation facility operator or responsible contractor’. While the suggested terms may at times be more accurate than the generic term ‘developer’, it would be difficult for Council to predict who may be the best party in the construction and operation of a development to carry out particular activities, and then to name these within the development permit. As a general principle such descriptions might limit the actions of a developer unnecessarily. The primary issue however, is that it is necessary for Council to identify a single party to which appeal may be made when activities during the construction or operation of the site contravene the existing approval. The term ‘developer’ is accepted as the description of this primary contact. It would probably be better if the existing approval did not use the term ‘applicant’ in Condition 26 and ‘landowner’ in Condition 24. On balance, it is recommended that the request for a change to the description of the responsible entity in the above listed conditions be refused. 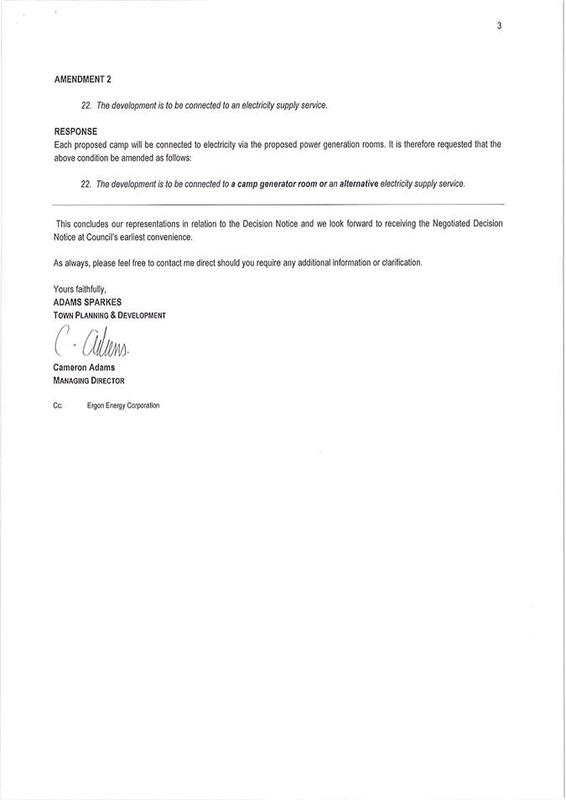 The applicant requests that Condition 22 be amended so that electricity supply to the development may be by on site generation, rather than by connection to the electricity supply service. As such supply is becoming common for camp developments that are established outside Council jurisdiction, and as the site is relatively remote, it is considered reasonable to allow onsite power generation. Any noise created by electricity generators is managed by Condition 36, which requires onsite machinery to not exceed a 5db noise level above the background noise level. It is recommended that Condition 22 be changed to ‘The development is to be connected to a camp generator room or an alternative electricity supply service’, as has been requested by the applicant. Figure 1 shows the subject lot (Lot 22 on SP248280) and the approximate location of the Accommodation Camp within the site. 1. Apply for funding under the Queensland Government’s Disaster Mitigation and Resilience Funding program for Stage 2 projects of the Roma Flood Levee, and potential project for Mitchell and Amby Flood Mitigation. 2. Authorise the Mayor and the CEO to sign the certification form for the application on behalf of the Maranoa Regional Council. The Queensland Government’s Disaster Mitigation and Resilience Funding program is now open, and is administered by the Department of Local Government, Community Recovery and Resilience. This is a streamlined process to deliver disaster mitigation and resilience funding to help protect communities from the impact of future flooding and other natural disasters. Council can now apply for the 2014-15 joint application package for access to all disaster mitigation and resilience funding programs administered by the Queensland Government. Submissions are due on 12 May, with announcements being made from June 2014. Local Government Floods Response Subsidy - $12.8 million available in 2014-15 for flood mitigation projects. Royalties for the Regions - $10 million available in 2014-15 for flood mitigation projects. Natural Disaster Resilience Program - $24 million available for flood mitigation and all hazards projects. (Council submits an application and the State allocates funds from one or more of the above programs). This is an opportunity for Council to apply for funding for projects incorporated in Stage 2 of the Roma Flood Levee. The remaining works in Stage 2 Combination 7 are: Extended Eastern Diversion Channel, and Eastern Levee. Combination 7 and House Raise DMRF Options 1, 2 and 3 are shown in the following table. It is recommended at this stage that Council provides approval to apply for funding for Stage 2 projects of the Roma Flood Levee under the Queensland Government’s Disaster Mitigation and Resilience Funding program. Further details on final costings and project details will be brought back to Council as the application process progresses, and further consultation is undertaken with the Department of Local Government, Community Recovery and Resilience. There is also opportunity to apply for funding for projects relating to the Mitchell and Amby Flood Mitigation project. A proposal is currently being compiled by Jo Tinnion from BMT WBM Pty Ltd – while details are not available at the time of writing, it is anticipated a summary will be available for the Council meeting on 23 April. Failure to apply for funding increases the burden for Council and ratepayers. It may be beneficial for Council to consider making a contribution towards the project as part of the 2014/15 budget. Corporate Plan 2009-2013 — 8.4.12(a) To distribute allocated Council funds to community organisations in a fair, equitable and efficient manner to address identified community need. 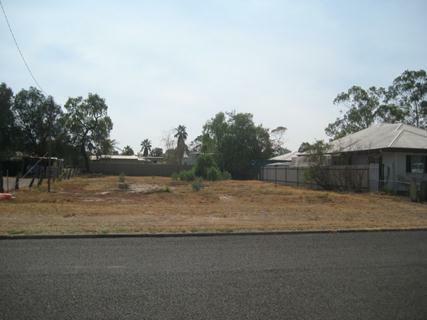 The applicant seeks approval for a Material Change of Use to establish Accommodation Units (2 Units) on land at 13 Major Street, Roma QLD 4455, described as Lot 2 on RP74877. The proposed development is generally consistent with the provisions of the relevant planning scheme, the Roma Town Planning Scheme 2006 including the Desired Environmental Outcomes and the Urban Area Code. 52. The developer is responsible for locating and protecting any Council and public utility services, infrastructure and assets that may be impacted on during construction of the development. Any damage to existing infrastructure (kerb, road pavement, existing underground assets, etc) that is attributable to the progress of works on the site or vehicles associated with the development of the site shall be immediately rectified in accordance with the asset owners’ requirements and specifications and to the satisfaction of the asset owners’ representative(s), and at no cost to the asset owner. The application generally accords with the policy position of the Roma Town Planning Scheme 2006. The applicant has proposed the establishment of two accommodation units on vacant land at 13 Major Street Roma. The subject site is within the Residential Zone of the Roma Town Planning Scheme. There are no previous approvals at the site, although the site was previously occupied by a single dwelling. "Accommodation Units" - means any premises comprising an integrated development of dwelling units and/or rooming units. The term includes multiple dwelling units, retirement villages and apartment houses. Total Gross Floor Area of both units is 310.2m². Site coverage, including the carport, is 36.6%, which is below the 40% maximum specified in the code. Adequate private open space is provisioned and fully fenced with a solid 1.8 metre fence. Four parking bays are provided under separate carports, plus one visitor bay within the front boundary setback. Parking for Unit 2 is provided in tandem, which is considered acceptable for a private residence. The development site is located within the Residential Zone and surrounded by existing residential land uses including single detached dwellings and multiple dwelling units. The site comprises an area of 935m2. Bungil Creek is less than 250 metres away to the north, and the site is subject to minor flooding (200mm) during the defined flood event (post Levee 1 levels). The buildings are above ground, on stumps and well above this flood level, however a condition for the floor to be above the defined flood event flood level (to 300mm) has been included. A preliminary landscaping plan has been included in the application which includes appropriate species and adequate landscaped area. Conditions requiring irrigation during establishment and ground cover planting have also been included. Each unit is designed with three bedrooms and three bathrooms. This is a characteristic pattern of house-style buildings that are designed for the accommodation of non-resident workers. The implications of this are an increased demand for parking on site, and that the occupants may be in the units on a short term basis. The Planning Scheme does not contain definitions that can be easily applied to non-resident workforce accommodation patterns, or even short term accommodation (apart from Hotel and Motel), so the defined use ‘Accommodation Units’ is considered the most appropriate definition. It is proposed to set Unit 2 (the front unit) 6.5 metres back from the front boundary. It is considered that this will not compromise the character or amenity of the area. The applicant has requested this reduced setback as the available building envelope is reduced by the sewer mains crossing the site to the rear, which prevents Unit 1 being any closer than 8.1 metres from the rear boundary. The site contains a sewer main traversing the rear and the side of the lot. The approval conditions the development to provide a minimum of 1.5 metres clearance between the sewer and any building foundation. As the development is impact assessable, public notification is required in accordance with Section 297 of the Sustainable Planning Act 2009. The application was publically notified between 25 February 2014 and 24 March 2014. No submissions were received during this period. No referrals to other agencies are required. Accommodation Units fall within the State Planning and Regulatory Provision charge category ‘Multiple Dwelling’ under the MRC Adopted Infrastructure Charges Resolution 2012. Infrastructure Charges will be charged at the rate of $21,000 per unit (for a three or more bedroom dwelling). The development will be credited with a discount of $21,000 for the previous (now demolished) dwelling. Subsequent approvals for Building Works and Plumbing and Drainage Works will be required. The site is situated within a developed urban area and its development will not result in any adverse impact on environmentally significant areas. The site contains no significant vegetation, so the proposed planting of trees as part of the development will ultimately contribute to the locality. The subject site is flat, within an urban area and not identified as being susceptible to land degradation. The site is mapped as within the defined flood event, but the landscaping and driveway treatments proposed will prevent contamination or erosion from the site during a flood event. The development involves the intensification of a residential use within a developed urban area. The proposal will not compromise biodiversity, water or air quality. The proposal is for residential development in a residential area and will not compromise the location of business and commercial development with the Commercial Zone and CBD, and will increase population densities immediately surrounding the Commercial Zone. Car parking spaces will be provided to cater for the intensification of the existing land use, and landscaping is proposed as part of the application. This appropriately intensified residential use close to the CBD, will enhance the vitality of the CBD. The proposal is for residential development within the Residential Zone and will not adversely impact on tourism within the region. The development will support industry, business and employment opportunities in the local area by increasing the range of accommodation available within Roma. The development site is located within an established residential area that provides convenient and efficient access to infrastructure and services. The development site is not located in proximity to major water cycle, rail or electricity infrastructure. The development is appropriately located within a residential area and will not adversely impact on the normal operation of the local road network. The development site is located within an established residential area, with infrastructure and services available to provide a suitable living environment for residents of the dwelling units. The proposed units are comparable to the neighbouring residential dwelling and integrate with the built form of the town. The development will have minimal impact on the streetscape as the development will incorporate landscaping and privacy fencing along the property boundaries, and is single storey and of the same form as the surrounding dwellings. The site is not identified as being susceptible to bushfire, flooding or other hazards. The proposed development will increase the range of housing types available to the community, by offering additional smaller dwelling units. The development is consistent with the existing land uses in the locality and will not have an adverse impact on noise levels, traffic volume, lighting levels or the local amenity. The proposed development will provide residential accommodation which will compliment a range of other established uses in the centre of Roma. The development does not involve business or commercial activities, and increases the need for services in the Roma CBD. The proposed units are single storey and consistent with the scale and character of residential development in the area. Landscaping and screen fencing will be established along site boundaries to enhance the visual amenity of the site and ensure privacy for occupants and adjoining residences. The development will not adversely impact on the safety and convenience of cyclist or pedestrian movements near the site. Conditions of approval require the provision of vehicle manoeuvring areas within the site, to ensure vehicles can exit in a forward direction for improved visibility and safety. The development site is located within the Roma Town area and is not situated in proximity to Good Quality Agricultural Land. The development is not located near a rail corridor. Access to the site is obtained via a local access street which is designed to cater for residential land uses. The development site is located in an established residential area with access to community services. The development will increase housing diversity in Roma Town, by providing additional higher density housing. The proposed development will increase the efficient use of existing urban infrastructure by adding an additional dwelling to the Priority Infrastructure Area. The development site is appropriately located in an established residential area and encourages efficient and equitable access to social infrastructure. The proposal does not involve industrial development. The proposed development does not involve any business, community or emergency services. The proposal is for a residential use in the Residential Zone and does not involve commercial development. The proposed development is located in an established urban area with access to electrical infrastructure. The proposed development is located in an established urban area with reticulated water supply available. The proposed development is located in an established urban area with reticulated sewerage available. Conditions of approval will require stormwater from the development site to be collected and discharged to the street to ensure no increase in post-development flows to adjoining properties and no adverse environmental impacts. The development will gain access to Major Street via a 6m two-way concrete crossover. This will be imposed as a condition of approval. The site access is currently obstructed by a fire hydrant and water meter. This will be conditioned to be relocated further along the site. The density of the development is appropriate for the location and will contribute to the residential amenity of the town. The development incorporates provision for five onsite car parking spaces which is compliant with the minimum requirement of 1.5 spaces per dwelling unit. The proposed car parking arrangement includes the provision of a duel carport for unit 1 and a single carport with a tandem undercover park for unit two. A single visitor parking space is provided at the front of the site. The development proposal does not require the creation or upgrade of new roads. Conditions of approval will require the construction of a sealed vehicle crossover to provide all weather access from the site to the roadway. The development site is located on a local access street which is intended to cater for residential land uses. The development site is not located in proximity to State-controlled roads and will not impact on their function as a link between major centres. Not Applicable - The development site is not located adjacent to a State controlled road. The proposed development is located on a local residential access street and is surrounded by residential land uses. The proposal will not be adversely impacted by noise generated from road traffic. Not Applicable - The proposed development is not in the vicinity of the aerodrome. (f) transient intrusions into the aerodromes operational space. The site is situated in an established residential area and is located an appropriate distance from gas and oil pipelines. The site is not located in proximity to refuse tips or effluent treatment plants. The proposed development is not located in proximity to the rail corridor. Not Applicable – The site does not adjoin a rail corridor. Not Applicable – The site is not located in proximity to watercourses. Not Applicable – The site is not located in proximity to areas of significant biodiversity or habitat value. (c) not to have an undesirable impact on the extent and magnitude of flooding. The site is impacted by the defined flood event, at a depth of 200mm. The units to be constructed with a finished floor level 300mm above this height. The development is a residential use and is not of a nature to cause environmental harm or nuisance through air emissions. The development is a residential land use that is consistent with the intent of the area within which it is proposed. The development is not anticipated to generate noise levels in excess of what would normally be expected in a residential area. The development will incorporate appropriate stormwater disposal for the proposed use. This will be imposed as a condition of approval. Conditions of approval will require any earthworks to be undertaken in accordance with Schedule 7: Standards for Construction Activity and the CMDG Design Guidelines. During construction, soil erosion and sediment will be managed in accordance with Schedule 7: “Standards for Construction Activity”. This will be imposed as a condition of approval. The development site is located in an urban area and is not identified as a Medium or High Bushfire Hazard Area. Not Applicable – The development is not located near to heritage or character buildings. The development is not located in proximity to any places of known indigenous or cultural heritage value. The proposed development involves the establishment of two single storey dwelling units on the site. The maximum building height above ground level will not exceed 4.5 metres, which is consistent with the character of the urban area. The combined footprint of the proposed buildings (including carports) will occupy approximately 370.2m² of the site, equating to 36.6% site coverage, which is below the maximum 40% site coverage for accommodation units. The development is consistent to the local character and amenity in this respect. Not Applicable – The development is not for dual occupancies. The proposed dwelling units are setback 6.5m from the front property boundary. The applicant is seeking a boundary relaxation of 0.5m as there is a sewerage line traversing the property at the rear. It is considered that the reduced setbacks will not compromise the character and amenity of the area. A minimum setback of 3.0 metres will be provided from the proposed buildings to the side boundaries of the site. The proposed units are adequately setback from site boundaries to ensure adequate sunlight, ventilation and open space is provided for residents. Screen fencing will be established between the units and along the site boundaries to provide private open space at the rear of the existing and proposed dwelling units. Landscaping will be established adjacent the site boundaries and in front of the dwelling units. Site landscaping will contribute to the overall amenity of the development and local streetscape. Although the proposed development requires impact assessment, the proposal does not conflict with the intent of the Residential Zone. The development is consistent with the scale and character of residential development in the Roma Town area and will contribute to the range of housing available within the community. 4. Development Approval 2013/18803 for a Material Change of Use for Accommodation Units (Two Units) on land at 13 Major Street, Roma QLD 4455, described as Lot 2 on RP74877. $21,000.00 is payable as infrastructure charges. This is based on an adopted charge of $21,000.00 per 3+ bedroom dwelling unit. This charge is levied in respect of a Development Approval for a Material Change of Use for Accommodation Units (Two Units) on land at 13 Major Street, Roma QLD 4455, described as Lot 2 on RP74877. Council recently received a letter from the Surat State School showing their appreciation for supporting their Battery Muster fundraiser throughout 2013 and seeking further support for their 2014 program. The program has enabled the P&C to raise vital funds to enhance the schools facilities and provide the students with a comfortable learning environment. 1. Donate all batteries received at Council waste facilities in the Maranoa region towards the Surat State School P&C Battery Muster fund raiser for the remainder of 2014. 2. Consider offering this opportunity to other interested schools next year. With the outcome of the 2013 Battery Muster fundraiser proving to be a great success, the Surat State School P&C wish to continue collecting batteries and raising funds for the school. In the past, the fundraiser has contributed to the cost of air-conditioning another classroom, enhancing the learning environment for the students. For this initiative to progress, it is proposed that Council consider donating all batteries received at its Waste facilities in the region to be donated to their muster for the remainder of 2014. Work Health and Safety requirements to be met by the responsible Surat P & C representative, when collecting the batteries from Council. This program offers a recycling opportunity and encourages recycling within the Region. The funds from such recycling is being spent within the community to improve the learning environment for children, whilst teaching a skill such as appropriate transportation and storage of matter. Corporate Plan 2009-2013 — 8.5.9(a) To provide an efficient and reliable refuse collection and disposal service for all serviced areas in the region. Subsequent to this DTESB has reconsidered the program and has suggested that the funding application (and associated funds) should be devoted to a broader business support program, such as the existing Business Excellence Program which is being run in the Maranoa in conjunction with DSDIP, Commerce Roma, the Western Star and others. Discussions related to the proposed business support program have commenced and are ongoing; at this stage a finalised plan has not been developed. B. Endorse financial support for Commerce Roma’s visual merchandising workshop, subject to the condition that attendance and involvement is promoted to all businesses in the region. C. Explore other opportunities with DTESB to implement business support initiatives in the Maranoa (as applicable). On 11 December 2013, Council resolved to contribute $1,500 to a Regional Services Program funding application for the proposed visual merchandising workshop (GM/12.2013/21). Following the submission of this application, DTESB has suggested that funding should be directed to a broader business support program, similar to the Business Excellence Program. Accordingly, discussions have commenced to determine what business support initiatives should be undertaken in the region. At this stage an event program has not been finalised, and the funds associated with GM/12.2013/21 will not be utilised in the foreseeable future. The business community has indicated that a visual merchandising workshop is still desirable and required. Commerce Roma has requested financial support ($1500) for a visual merchandising workshop within their Shop Local – Invest Local (SLIL) program. It is anticipated that the workshop will be run on 27 and 28 May 2014, including a Breakfast workshop at the Santos shopfront (McDowall St) where participants will learn visual merchandising theory with practical demonstrations. Face-to-face follow ups will be held on the second day (28 May), with the consultant providing individual business assessments with written feedback to SLIL participating businesses. Based on business training needs acquired through a survey conducted by Commerce Roma in recent months, it has verified that the services of a visual merchandiser to assess and train local businesses is both wanted and needed. A visual merchandiser from Nick has been sourced to come to Roma to deliver a workshop and individual business assessments on 27 and 28 May 2014. Nick has a current working relationship with Santos GLNG, and is able to offer a subsidised cost for travel, the workshop and business assessments during this time. It is planned to host a breakfast workshop at the Santos shopfront, which will offer the opportunity for an interactive workshop where participants will learn theory in addition to a visual demonstration. Businesses will leave with both information and takeaways to utilise back in their businesses to improve their displays and aesthetics of their shops. The total cost required for this initiative is $1,500. This includes all travel, workshop preparation and planning, breakfast for an anticipated 30 businesses, show bags and contents, and individual business assessments with written feedback. This is clearly heavily subsidised by Nick and a great opportunity to provide this level of training and consultancy in Roma. Is this sort of what you needed?? $1,500, allocated to the Business Excellence Program GL, within the Business Development budget. Corporate Plan 2009-2013 — 8.4.1(b) To facilitate the provision of support initiatives for existing businesses and industry in the interest of maintaining and developing the regional economy. A local builder’s group meeting was held on Friday 28 March 2014 in Roma, to discuss issues that are pertinent to the building industry in the Maranoa. As this was an inaugural meeting, it was also used to delineate the vision for the group. That Council receives and note the Officer’s report as presented. A local builder’s group meeting was held on Friday 28 March 2014 in Roma, to discuss issues that are pertinent to the building industry in the Maranoa. 5 members attended the initial meeting (3 x Council representatives, 2 x builders), with 5 apologies received from builders who were unable to attend the event. It is anticipated that attendance will continue to build as awareness about the group, and its benefit, spreads within the business community. · An opportunity for Mandy Schneekloth (Coordinator – Council Buildings & Structures) to network with local builders and ask questions that are relevant to her role within Council. For your information, please find attached the minutes from the meeting on 28 March. The next meeting is scheduled for early May 2014. · VIC stats indicate that $1million construction investment results in 7 local jobs – significant wealth retained in the local economy. · Question – Do local builders have any concerns about the process to do business with Council? · Answer – sub-$150,000 work packages (quote system) are not complicated – tender system for bigger jobs is an issue. · Council will be holding a workshop on our procurement and tender process in June 2014 – all businesses welcome. · Council will release a ‘guide to doing business with Council’ (approximately June 2014) to help educate the business community on the process and clear up any misconceptions. · Council will release the My Maranoa App in April 2014– A mobile communication tool for residents and visitors. · A business directory will exist on the App and free registrations are now available. · App will inform local residents and council officers alike – approx. 75% of regional businesses don’t have an online presence; therefore it’s difficult to know what businesses are operating in the region and what their capability is. · MS has difficulty with getting 3 quotes from local tradespeople for various maintenance/building tasks. · MN – it is difficult to find the time to quote. · MS – could a local consultancy business (or similar) provide casual office support? · Council needs to implement systems for better communication (internally), non- ambiguous specification for work etc. · Registered tradespeople are subjected to annual audits. · Avoids duplication of asking for third-party accredited systems & processes, financial information etc. – all information available in one place. · Question – Is there enough land available for development? · Best night for meetings – Thursday was suggested.